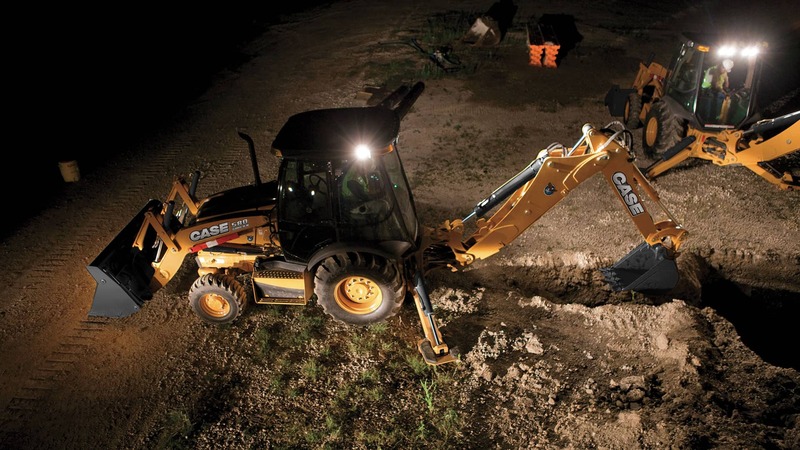 The CASE 580 Super N Backhoe features optimum productivity in a comfortable package. With distinguished power and top industry speeds, this machine will get you where you need to go. The industry leading forces of the 580 Super N is apparent with its PowerLift feature. This feature allows you to break through some of the toughest soils. The use of CEGR technology to meet Tier 4 regulations also offers increased fuel efficiency without sacrificing power or visibility. High efficiency CASE engine, which provides better performance and greater fuel economy. Pro Control System: significantly enhances the smoothness and precision of the backhoe movements. Backhoe: the arm made of welded steel plates, in a closed box, ensures greater robustness and reliability. The 580 Super N offer superior performance on both the backhoe and loader side of the machine. With excellent breakout forces and outstanding reach, this model is a great addition to any fleet. The PowerLift feature on the 580 Super N increases operator productivity by breaking through some of the toughest soils. It also boasts the highest lift capacities in the industry. To help reduce material spillage during roading, equip the machine with the Ride Control or Auto-Ride Control (4WD ONLY) options. Operators can also customize their forward/reverse transitions on the Powershift S-Type and Powershift H-Type transmissions with the industry-exclusive SmartClutch modulation. The side mounted, high intensity, flex lights allow operators superior jobsite visibility for when late night operation is necessary. The 580 Super N features our new, Interim Tier 4 engine with CEGR technology and diesel particulate filter. This engine boasts a minimum 5% better fuel efficiency than our previous models and faster response times while meeting current environment standards. The hydraulic system is also designed to offer optimum fuel efficiencies with maximum power. Operator’s will be able easily communicate to their spotter and enjoy superior cross-ventilation with rear-quarter windows that open. Floor to ceiling glass provide excellent visibility to trenches and spoil piles. 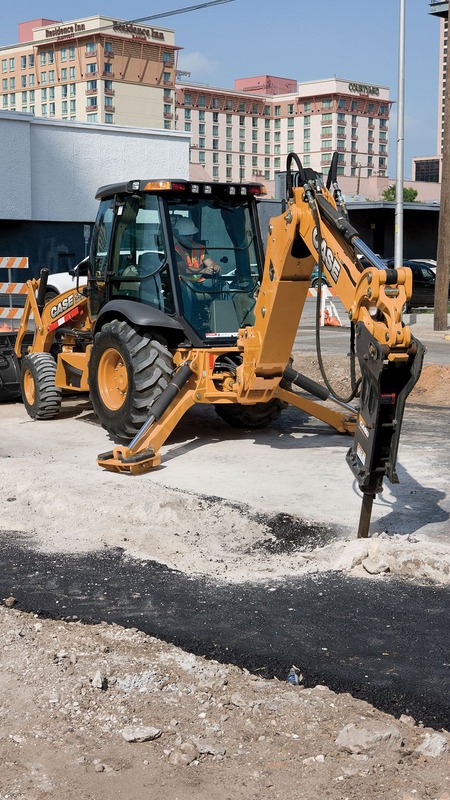 Making sure every operator is comfortable, CASE offers their traditional foot swing control, two-lever controls, or pilot controls for operating the backhoe. The CASE pilot controls are the most ergonomic in the industry featuring unlimited adjustments fore/aft, tilt in/out, and full surface adjustable wrist rests. The fully integrated loader control lever puts operation at the operator's fingertips for faster response times. Maximize uptime with simple and efficient daily maintenance. Swing-out coolers and ground level hydraulic test ports are easily accessible. While a flip-up hood, spin-on filters, grouped service points and serviceable axles without complete disassembly make routine upkeep easy. Vinyl mechanical suspension seat w/180° swivel. Electronic hand and foot throttles. Ergonomic loader control lever w/push-button activation of differential lock and transmission de-clutch. Backhoe foot-swing w/3 lever control. (- 2) Accessory power plugs (30 amp). Coat hook w/tether strap (cab only). 2 in (51 mm) retractable seat belt. Over center design, Fabricated “S” boom. Dipperstick Integrated Serrated Grip Teeth. 17, 940 lb•ft (24 370 N•m) swing torque. Wing stabilizers w/cleated dirt pad. Case F5C Interim Tier 4 with CEGR/DPF. IT4 or Tier 4 A Emissions compliant. Full flow engine oil filter. Air cleaner - replaceable dry type. High Pressure Common Rail computer. Controlled injection with diagnostic features. Electronic throttles (foot and rotary hand). Single-lever control for lift and tilt. Clutch disconnect button on loader control and shift levers. Standard Powershuttle, 4F-4R Power Shuttle Synchromesh transmission. 2WD heavy-duty front axle w/ 11L x 16 tires. 4WD heavy-duty mechanically driven front. Axle w/ 12 x 16.5 tires and drive shaft guard. 2/4WD heavy-duty outboard planetary drive w/ 17.5L x 24, 10PR (R4) tires. 11.8 in (300 mm) torque converter. Electric differential lock control, push button. Park Brake, spring applied, hydrualic release (SAHR). Ground Level Remote Hydraulic Test Ports. Variable Displacement Axial Piston Pump: Maximum Loader Capacity: 40 GPM @ 2340 psi (151.4 lpm @ 161 bar). Loader Torque Regulation: 27.4 GPM @ 3450 psi (103.4 lpm @ 238 bar). Maximum Backhoe Capacity: 40 GPM @ 3100 psi (151.4 lpm @ 214 bar). Backhoe Torque Regulation: 35 GPM @ 3450 psi (132 lpm @ 238 bar). 7 micron, spin-on oil filter. Lights - Cab and Canopy: (2) Rear tail/stop, (2) Front flashers/turn, (2) Rear flashers/turn. Cab only: 2 front driving lights (55 w), 2 front, 2 side (left & right) & 4 rear adjustable, halogen work lights (55 w). Canopy only: 2 front driving lights (55 w), 2 side (left & right) & 2 rear adjustable, halogen work lights (55 w). Ride Control type load damper. Comfort Steering with momentary latching switch, two-speed steering pump and 3rd/4th gear cutout. ROPS/FOPS certified protective cabin with rear wipers and floor mat. Cabin Convenience Package containing: Pull-down sun visor; Front and rear window washer; Left-hand storage tray; Deluxe interior package; Tilt steering column; Sound Reduction Package for closed cabin models – levels reduced to 72dB (A); Right-hand threshold storage box; Viscous fan. Air-conditioning for closed cabin models. Mechanical suspension 180º swivel seat with flip-up armrests, cloth or vinyl, adjustable in: Seat angle, weight, backrest angle and lumbar angle. Air Ride suspension 180º swivel seat with flip-up armrest. Electric height adjustment, lumbar support and adjustable back rest – closed cabin units in cloth, canopy units in vinyl. Pull-down sun visor for canopy models. 3in (75mm) seat belt for mechanical and air suspension seat. Cold Weather Starting Aid – rack heater with two 12V batteries. Auxiliary hydraulics for loader-mounted equipment with thumb-operated proportional control. Loader linkage without loader bucket. Tool portfolio of additional attachments. Auxiliary hydraulics with flow from 0 to 36gpm (0 to 136L/min). 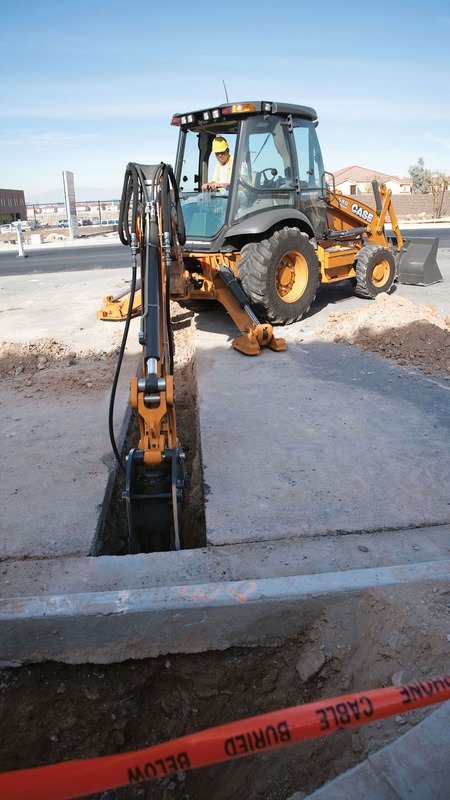 Two-lever control – backhoe or Extendahoe®). In-cab switchable “excavator to backhoe” control pattern change. Powershift H-Type transmission, 4F(forward)-3R(reverse)-speed hydraulic clutch shifting with automatic function. Rear axle heavy-duty outboard planetary drive with 19.5 L x 24.0 tires, both in 2WD or 4WD. Hand lever operated manual controls. Front tires – 11.0 L x 16.0 or 12.0 L x 16.5. Rear tires – 17.5 L x 24.0 or 19.5 L x 24.0. Front counterweights – 700 and 1,100lb (318 and 500kg).